Oxford University Press, USA, 9780195183429, 167pp. As featured in AMC's Breaking Bad, given by Gale Boetticher to Walter White and discovered by Hank Schrader. I lean and loafe at my ease....observing a spear of summer grass." The publication of Leaves of Grass in July 1855 was a landmark event in literary history. Ralph Waldo Emerson judged the book "the most extraordinary piece of wit and wisdom America has yet contributed." Nothing like the volume had ever appeared before. Everything about it--the unusual jacket and title page, the exuberant preface, the twelve free-flowing, untitled poems embracing every realm of experience--was new. The 1855 edition broke new ground in its relaxed style, which prefigured free verse; in its sexual candor; in its images of racial bonding and democratic togetherness; and in the intensity of its affirmation of the sanctity of the physical world. 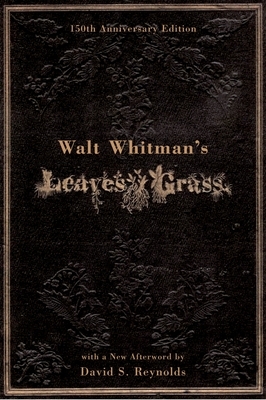 This Anniversary Edition captures the typeface, design and layout of the original edition supervised by Whitman himself. Today's readers get a sense of the "ur-text" of Leaves of Grass, the first version of this historic volume, before Whitman made many revisions of both format and style. The volume also boasts an afterword by Whitman authority David Reynolds, in which he discusses the 1855 edition in its social and cultural contexts: its background, its reception, and its contributions to literary history. There is also an appendix containing the early responses to the volume, including Emerson's letter, Whitman's three self-reviews, and the twenty other known reviews published in various newspapers and magazines. This special volume will be a must-have keepsake for fans of Whitman and lovers of American poetry. David S. Reynolds is Distinguished Professor of English and American Studies at Baruch College and the Graduate Center of the City University of New York. Among his many books are Walt Whitman (part of Oxford's Lives and Legacies series), Walt Whitman's America: A Cultural Biography, which won the Bancroft Prize and was a finalist for the National Book Critics Circle Award, and Beneath the American Renaissance, winner of the Christian Gauss Award. A regular contributor to The New York Times Book Review, he lives in Old Westbury, New York.